Don’t get me wrong, I’m not saying that every Puerto Rican Mother’s Day is like my family’s but if it is then Hallmark will stay in business for a very long time. It all started with me deciding to visit my mother in Chicago for Mother’s Day. Our holidays are usually held in a relative’s house who volunteers to have 20 – 40 people over. More or less but usually more. Most Puerto Ricans are good communicators. Translation — we can talk a LOT! We are also good listeners. Translation — we have the ability to hear 5-10 simultaneous conversations at a time and are usually in all of them. The old adage “putting in your 2 cents worth” doesn’t work with us. We give 100% to our (and everyone else’s) conversation. Keep in mind that we do this with the radio or stereo playing salsa music (volume on high) so we can hear it while talking (uhhh … well, this doesn’t work for me but it works for plenty of my family). But I digress — back to Mother’s Day. My sister told me that every mother gets a gift. Okaaaayyyy …. 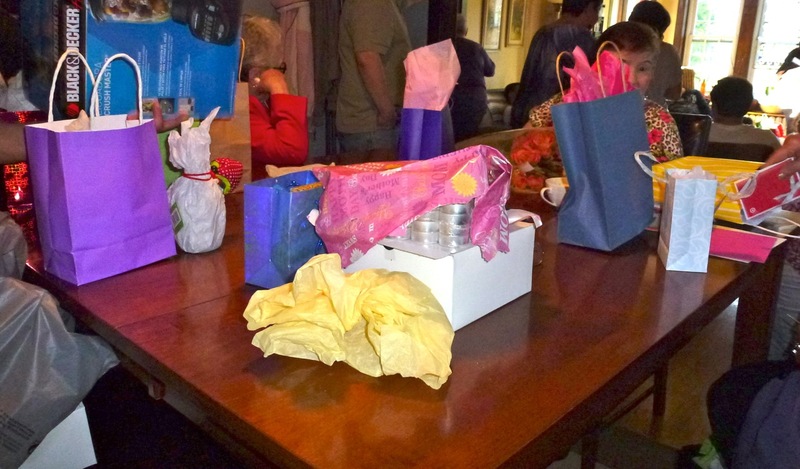 “just a small item … ” Small items add up when there are 15 plus mothers in a room. Oh — and don’t forget the cousin and niece who are mothers to their “dogs.” Oh — and don’t forget that since we don’t celebrate fathers day we need to give the fathers a small gift too so they’re not forgotten. There is very little space to turn around in the apartment without looking into someone’s face or back. Let’s call it cozy, shall we? The food was delicious — we had the usual rice with gandules (pigeon peas), biftec (steak), fried chicken, potato salad, a green salad and bread. There was so much rice! I think my aunt must’ve thought a much larger crowd was coming but we had a few people who couldn’t make it because of illness, etc. For dessert we had a “funfetti” cake that my niece made, bite-size cheesecakes, a “real” cheesecake and arroz con dulce (rice pudding but Puerto Rican style). After eating, it was time to open gifts. I think there has to be a better way than searching for the “right” person through the crowd of people. 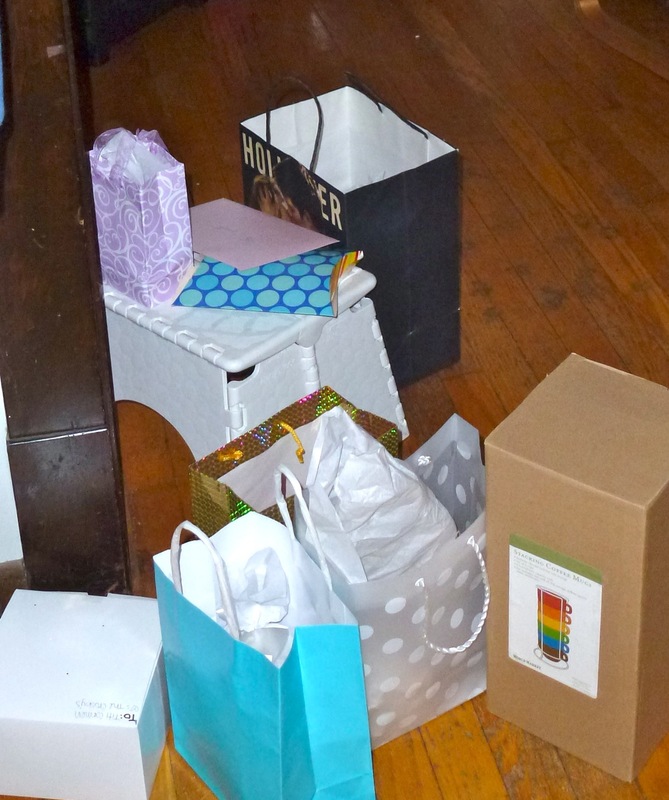 Perhaps next time I’ll alphabetize my gifts so that when I see a person I can quickly find the right one. 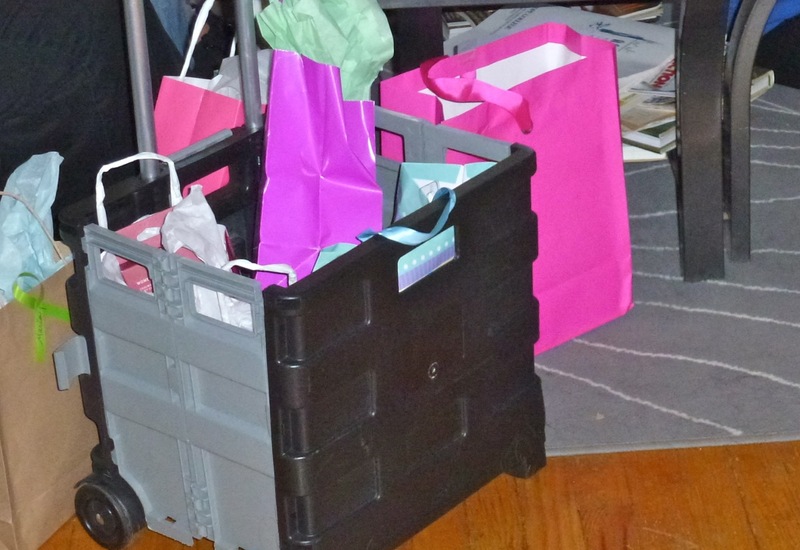 One of my cousins came prepared with a cart to bring her gifts to the party. I left with 2 shopping bags full of gifts. Gotta love this family! Our holidays are definitely organized … even if they are a little on the excessive side. And to think, all the years I lived in Seattle and missed out on all the fun.